Recently a question was asked on Twitter about inclusive co-design workshop techniques, particularly when working with people with vision impairment. This got us thinking about how Northcott Innovation has run workshops and the particular methods we’ve used to make sure everyone in the room has the opportunity to contribute to the co-design process. We’ve put together the following so that it might be helpful to anyone working with people with disability in a co-design environment. 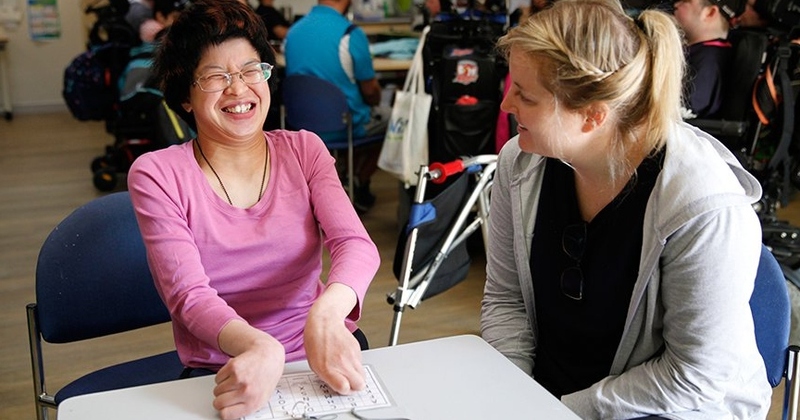 It’s by no means an exhaustive list of techniques but we hope it starts a conversation about how design workshops can become more inclusive, particularly for people with disability. We have found several ways to adapt visual methods for people with vision impairments that are relatively easy to implement. Powerpoint can be used as a method to record the journey mapping of people with vision impairment. Working with another person, the participant can talk through the journey which is placed across slides of a Powerpoint presentation. This is accompanied by an audio track of the person talking through the journey. Clicking through the slides gives a sense of movement. The ideas in the presentation can then either be used as a “post-it note” in a larger collection or the input of other participants can be added. We use craft objects a lot during our design work. When laid out on a table, they allow people with vision impairment to ‘feel’ their way through a journey. These items can also help people with an intellectual disability to communicate during the co-design process. A lot of people with vision impairment have excellent spatial awareness skills. They can lay out a journey as they see it in their heads, then the design team can ask them about their motives for the particular arrangements they have made. Why did you put that there? Why did you pick that object? Why did you put that box on top of that one? What does it mean to you? Can you describe it to me? We’ve found that the best conversations occur when we use objects that are not too representative. For example, when asking about the housing needs of a person with disability we try not to use a toy or doll’s house, we will instead use a series of empty boxes, or perhaps Lego. The use of symbolic objects (such as doll’s house to represent a house) or miniature items (such as tiny tables and chairs within a dolls house to represent furniture within a home) can sway the conversation away from the individual’s thoughts and towards the objects presented. For example, if the miniature dining set in the dolls house only has two chairs, then the individual may only talk about themselves and one other person, rather than their desire to live with a large group of friends from school. If a tea set only has tea cups and a tea pot the person may not talk about their passion for spicy curries. Instead we use empty boxes to build houses and services, coloured pom poms and paddle pop sticks to design and create outdoor spaces, and pegs and pipe cleaners to talk about people within their communities. Not all the technology used within inclusive design strategies would be classed as cutting edge. Traditional devices such as portable Braille writers are an excellent addition to design workshops for participants who use them, as they enable the user to Braille their thoughts directly onto a page. Portable Braille Writers are small handheld devices which enable the user to Braille text onto paper quickly and easily. We stick the printed Braille onto the butchers paper or wherever we are collecting artefacts (notes, images etc) created by participants and the person who created it will explain what the braille conveys. We sometimes also encourage the person to feel the other post-it notes (even though they can’t read them) and we’ll read them out while they are touching them, we can then add onto these post it notes any other thoughts the individual may have. This means the person with the vision impairment has a tangible way to have their ideas documented and collected with everyone else. They are included. Scribes are another way to ensure people with vision impairment can participate in a workshop. If the group is large, we will assign someone to be the scribe for an individual, ensuring every one of their thoughts is captured, documented and added to the greater collection. In smaller groups, the facilitator has taken on the role of scribe. Obviously, there are many types of access requirements and we’ve only focused on a few here. We hope this can start a broader conversation about co-design workshops and inclusion. Ⓒ 2019 Northcott Innovation. All Rights Reserved.